The complete set of aQu products. So, lets get the details out shall we? Im pretty sure when it comes to new brands in the market, especially when its a skin care range, it is a concern when it comes to how suitable the skin care is to suit our Malaysian environment and asian skin. What makes aQu stands out, would be that this product is a water based skin care product which consist of natural plant and fruit extracts. The formula has been carefully formulated based on the latest biotechnology advances and caters to every youth and young executives needs. Carey Ng, aQu's official ambassador. The ingredient was specially chosen to be gentle and suitable for all skin times. The ingredients which made this product a masterpiece of its own would be, aloe vera, jojoba oil, vitamin E, chamomile and sunflower seed among many others. From Left; Tengku Mudzaffar, Cery Ng and Adura Kamarul. 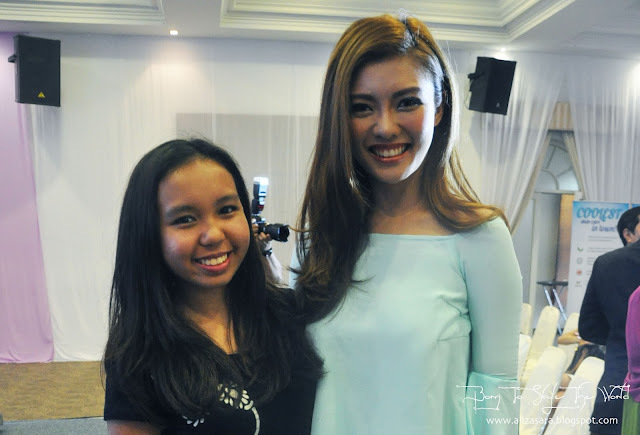 Present at the launch was Adura Kamarul Zaman, who is the marketing director of Fountain of Health Sdn Bhd. She was very proud to announce that aQu will be available at Watsons as they see their target markets preferred Watsons as their health care store. She also added " In this day and age, confidence plays a number one role in our lives and often times this can be affected due to unhealthy looking skin as we are always on the go and working to meet deadlines. " Couldnt agree to it more, as i do believe having confident skin does bring out the confidence in you. 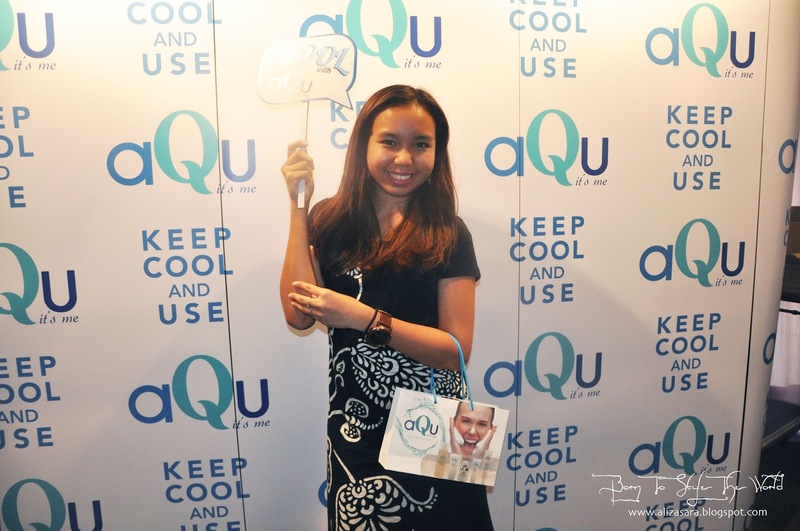 Their tagline basically explains everything where it says ' Keep Cool and Use aQu - Its me represents confidence '. Proudly launching the occasion by presenting the entire range. General Manager of Trading Watsons, Caryn Loh even had a say that Watsons has always associate with product innovation so that their customers are diversified with choices of products to choose from. 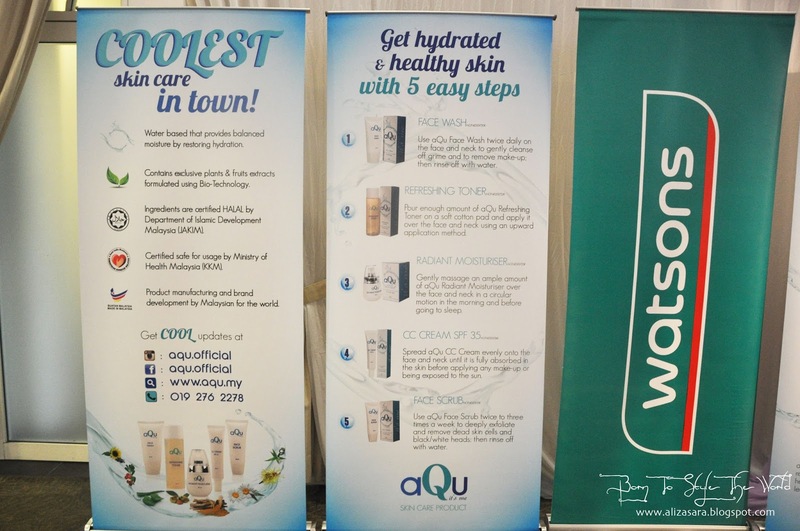 Caryn Loh said "And with the launch of aQu, its me skin care products, and its exclusivity at Watsons, we will always stay ahead in the business to cater the needs of our customers today." 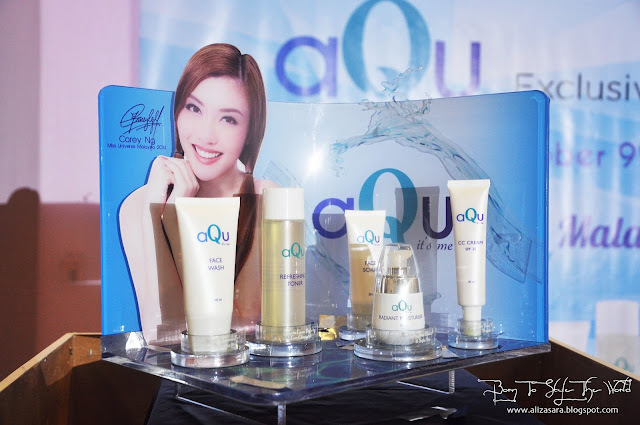 With its price ranging from as low as RM20 to RM35, and RM132.90 for a complete set of 5 products, aQu is without a doubt an affordable basic maintenance skin care range. Personally i cant wait to give their protective complexion corrective cream (CC cream) a go, which also contains SPF 35 which helps protect your skin from the sun. Well, thank you to Fountain of Health for having me at your launch, and i'll be honest to say that i cant wait to try this cool product! 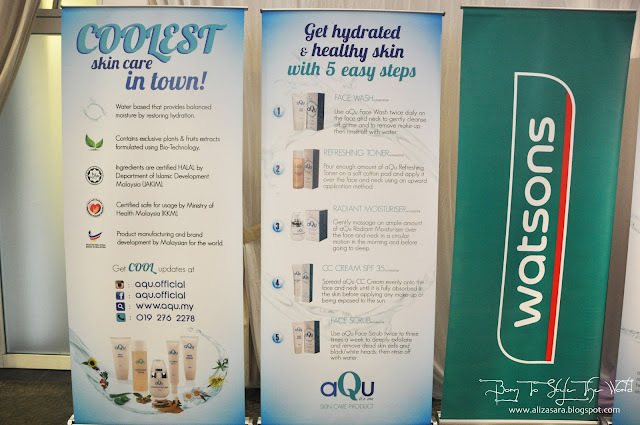 aQu is exclusively available at selected Watsons outlets nationwide, and has ensured that ingredients used are certified as HALAL by the department of Islamic Development Malaysia (JAKIM) and also certified by the Ministry of Health (KKM). I guess what needs to be said, has been said. I'll try my best to give you a review of my thoughts if you would want me to do it :) hehe. For now, if you have any other hesitation on the product, why not check out their official website at www.aqu.my to get yourself more information on it. 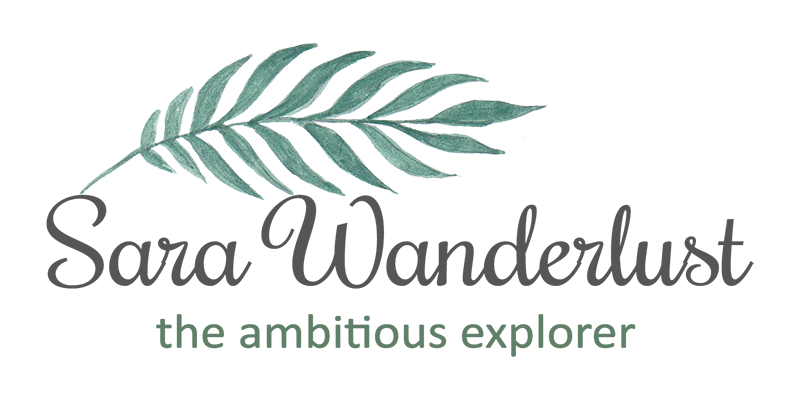 Thanks for dropping by ze blog. Looks like a great range of products. Since it is by Watsons, I think the prices should be reasonable. I should check out this range in Watsons... Ah price wise its pretty affordable plus i like anything that's water based! will check this product from watson soon!! wow nice event, I saw this selling already. Should check out the store soon. Malaysian products meaning it is suitable for Malaysians skin. The event looks fun thou I could not make it due to my work schedule. it should be suiting your skin a lot, heard it's for younger girls just like you. I found your blog quite interesting about Facial Cleanser and Facial Serum and the concern in the blog is really impressive.I always prefer to read the quality content and this thing I found in your post this is how i always used Organic skin Care.